Fix any boost leak problems in your MK4 GTI or GLI by replacing the old OEM PCV hosing with the Eurojet PCV Hose Kit. We have this IN STOCK and ready to ship! 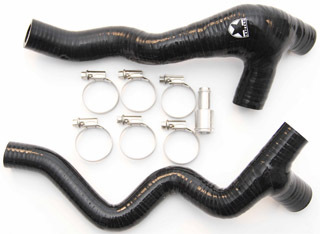 The Eurojet PCV Hose Kit is a direct OEM replacement for your MK4 GTI/GLI. Replace your worn out OEM PCV hoses with replacement hoses from Eurojet. The Eurojet PCV Hose Kit is made from very strong, 5-ply silicon rubber hoses to ensure that the hoses will last the same, if not longer, than the OEM hoses at a cheaper price. If it's been a few years since you've replaced any of the hoses in your MK4 GTI or GLI, it's time to replace them to avoid and eliminate dangerous leaks. In fact, if you've never replaced any of your hoses in your engine before, you may even see an increase in performance, freeing up any lost horsepower from build up or leakage. The Eurojet PCV Hose Kit for the MK4 GTI/GLI also comes with a 5-year guarantee. The Eurojet PCV Hose Kit for the MK4 GTI/GLI is a medium-level installation. Basic mechanic knowledge about turbocharged engines is recommended.